~ Life in general and becoming a Mum in Dubai. BLW or baby led weaning is one of the ways to start your little one on solids. In a nutshell BLW means that you wait until your little one is about 6 months, you do not puree food and you basically let your baby feed herself. Because the digestive system is a bit more mature at six months then at four you can basically feed your baby the same as what you are having as long as there is no added sugar, salt, honey or whole nuts. As (breast)milk is the main source of nutrition you don’t need to worry about how much or how little you baby is actually eating. This method is perfect for unorganised Mums like me. When we go out I don’t need to think about taking purees etc with me. She can either have breast milk, some of whatever I am having or I can give her some finger foods that I have rolling around my rather copious changing bag. How do Mums cope without one? The one big downside to BLW is the MESS! The little mermaid is thoroughly enjoying her discovery of different tastes and textures, but her hand mouth coordination leaves something to be desired. She is also not swallowing that much yet so once she is done chewing she just pushes the food out of her mouth. She also enjoys waving about with a loaded spoon, smushing food on her tray and dropping bits over the side. Thankfully I have a great helper when cleaning up; my dog! Indy loves the fact that the little mermaid is now eating proper food and he loves it even more that she is not very good at it (yet!). Impatiently he will wait in the lounge to be allowed into the kitchen once she has finished. As soon as the door opens he runs in and won’t stop till he has gobbled up every tiny little morsel of food. I clean the little mermaid by dunking her in the bath and often she will be just wearing a nappy when having dinner to save on laundry. I really enjoy watching her eat and it is so nice that she can join in with family meals. She will sit in her high chair next to us and enjoy the same foods that we do. I really like the fact that mealtimes are not a struggle as it’s not about how much she eats. 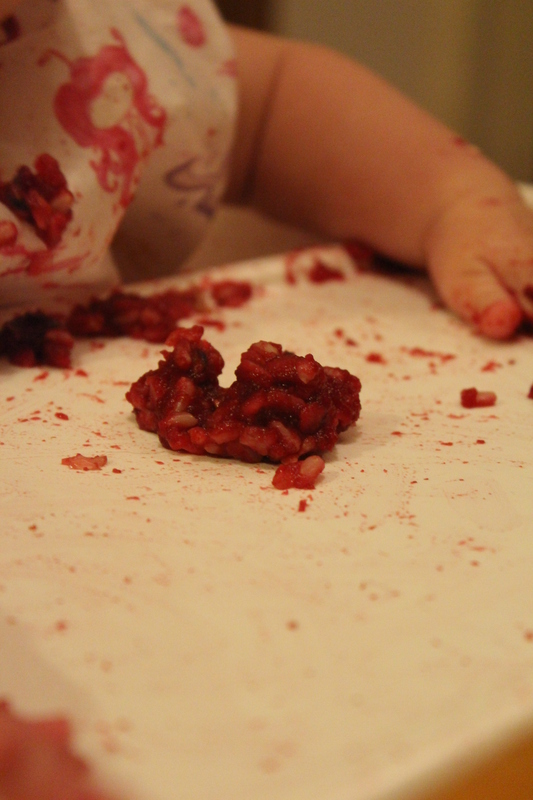 The mess will hopefully become less as she becomes more coordinated, starts chewing better and swallowing more. The magical healing powers of a Cinderella plaster.